If you are a student, teacher, programmer, geospatial or IT administrator, GIS analyst, researcher, or scientist looking to do spatial analysis, then this book is for you. Anyone trying to answer simple to complex spatial analysis questions will get a working demonstration of the power of Python with real-world data. Some of you may be beginners with GIS, but most of you will probably have a basic understanding of geospatial analysis and programming. Geospatial development links your data to places on the Earth's surface. Its analysis is used in almost every industry to answer location type questions. Combined with the power of the Python programming language, which is becoming the de facto spatial scripting choice for developers and analysts worldwide, this technology will help you to solve real-world spatial problems. 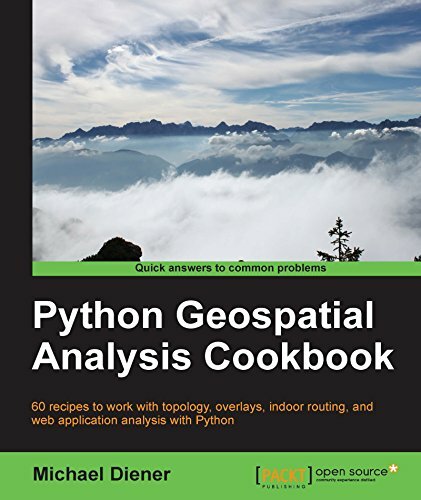 This book begins by tackling the installation of the necessary software dependencies and libraries needed to perform spatial analysis with Python. From there, the next logical step is to prepare our data for analysis; we will do this by building up our tool box to deal with data preparation, transformations, and projections. Now that our data is ready for analysis, we will tackle the most common analysis methods for vector and raster data. To check or validate our results, we will explore how to use topology checks to ensure top-quality results. This is followed with network routing analysis focused on constructing indoor routes within buildings, over different levels. Finally, we put several recipes together in a GeoDjango web application that demonstrates a working indoor routing spatial analysis application. The round trip will provide you all the pieces you need to accomplish your own spatial analysis application to suit your requirements. Easy-to-follow, step-by-step recipes, explaining from start to finish how to accomplish real-world tasks.